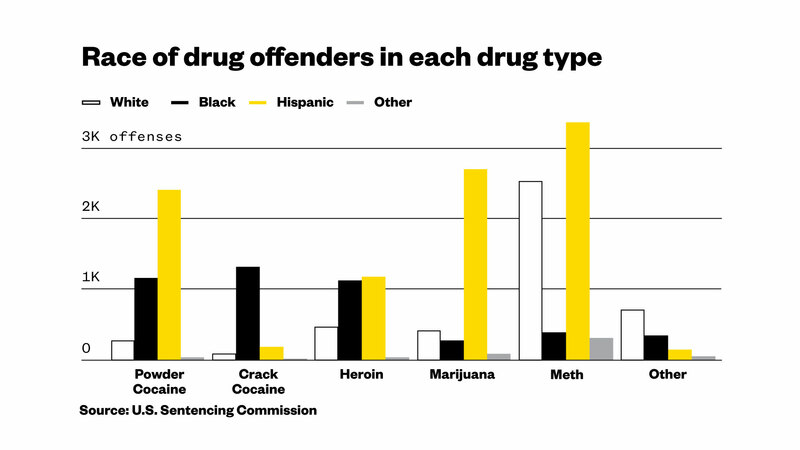 The federal government released a new batch of data Monday about drug prosecutions in 2016, and the statistics show that African-Americans and Hispanics are still prosecuted far more frequently than white people for nearly every type of drug crime. Those stats are relative to an overall American population that is 77 percent white, 13 percent black, and 17 percent Hispanic. The data shows that although federal marijuana prosecutions have become less common since states have legalized the drug, the feds are still busting people for weed, and the targets of those cases are overwhelming non-white. There were 3,528 federal marijuana prosecutions in 2016, fewer than for any common drug except crack cocaine, and a whopping 77 percent of those involved Hispanic defendants. Research has consistently shown that white people are actually more likely than African-Americans and Hispanics to sell drugs and about as likely to consume them, but they are still arrested and prosecuted less often than people of color. “Higher arrest and incarceration rates for African Americans and Latinos are not reflective of increased prevalence of drug use or sales in these communities, but rather of a law enforcement focus on urban areas, on lower-income communities and on communities of color as well as inequitable treatment by the criminal justice system,” according to the Drug Policy Alliance, a New York City-based nonprofit that seeks to end the war on drugs. The federal data shows that 30 percent of the people charged with selling powder cocaine in 2016 were black, 62 percent were Latino, and only 7 percent were white. The disparities were even higher for crack cocaine: Nearly 83 percent of the federal defendants were black. The opioid epidemic has attracted significant media attention in part because it cuts across racial and class lines, but in federal heroin cases, only 16 percent of the offenders were white; 40 percent were black and 42 percent were Hispanic. Across the board, 97 percent of people charged with federal drug crimes pleaded guilty. The situation probably won’t improve under the Trump administration. The president has repeatedly blamed immigrants for America’s drug problem, but the federal data shows that 71.8 of drug offenders in 2016 were U.S. citizens. Attorney General Jeff Sessions is a longtime supporter of the war on drugs who supports harsh mandatory minimum sentences for drug offenders. And under the Republican plan to replace Obamacare, millions of Americans could lose access to addiction treatment.